February 9, 2011 - ASTM certification for the amphibious CTLS Floatplane was accepted by FAA last month and then made its public debut at the U.S. Sport Aviation Expo in Sebring, Florida. 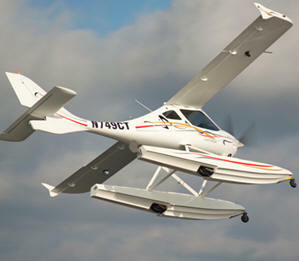 The company announced that it is now ready to accept orders for the CTLS Floatplane. German aircraft producer Flight Design, known for its speedy development cycle, now brings a floatplane to their worldwide dealer network. Flight Design USA distributor Airtime Aviation of Tulsa, Oklahoma in cooperation with Flight Design GmbH and Clamar Floats of Ontario, Canada, completed over 150 hours of flight testing in preparation for the final approval. The certification process involved no changes to the basic CTLS airframe. "To certify the CTLS we had to replace the propeller with a slightly different model but no structural changes were required," said Airtime partner, Tom Gutman. "We added a gear position indicator and the water rudder handle along with a split brake handle to allow for castoring steering on the ground." "The Clamar floats match the structure and the feel of the Flight Design planes," noted Tom Peghiny, president of importer Flight Design USA. Pricing has been set at $39,900 plus the prop exchange. This price means that it would be possible for a customer to buy a new CTLS Lite plus amphibious floats for $161,895 in ready-to-fly form. "Owners may add the Clamar floats to existing CTLS aircraft. "We are accepting orders effective immediately and we can start customer deliveries in less than 60 days," observed John Gilmore, national sales manager for Flight Design USA. Flight Design is a 24-year-old air-sport products producer based in Germany. The company remains the worldwide market leader thanks to its well-received CT series of light aircraft. More than 1,700 of these aircraft are flying in 39 countries. One of the first aircraft certified under ASTM International standards in 2005, the CT ("composite technology") series remains the top-selling LSA in America through six consecutive years. Clamar's 1400 float series allows the CTLS to takeoff with a water run of only 15-20 seconds at full gross weight. The CTLS Floatplane cruises at 100 knots where the wheeled model achieves 115 knots. Airtime is continuing development and offers a straight float (non-amphibious) version. Useful load for the CTLS Lite with the amphibious floats is 500 pounds. The Flight Design CT is a family of high-wing, tricycle undercarriage, two seat ultralight and light-sport aircraft produced by Flight Design of Germany. The family includes the original CT and the CT2K, CTSW, CTLS and the new MC models. One reviewer of the CT2K writing COPA Flight in October 2004 described the aircraft as "fast, comfortable, roomy and very capable of long cross country flights for little money" and faulted the aircraft only for its difficulty slowing down from its cruise speed of 130 knots to its final approach speed of 50 knots, requiring careful planning to lose 80 knots between entering the circuit and stabilizing the aircraft on final approach. Although the standard and required equipment varies by country, the CTSW has a standard Ballistic Recovery Systems parachute for the airframe. The BRS can be used to lower the entire aircraft to the ground in a controlled descent in the event of major structural failure, incapacitation of the pilot, or engine failure over mountainous terrain. Flight Design sold the first LSA to India and was the first LSA to earn Chinese Type Design Approval. A newer model, the MC (metal concept), has generated excitement in the market, for more information.